Alderbrook House is a country detached house located one mile from the village of Glenbrien near to Enniscorthy in the Sunny South East of Ireland. The cottage can sleep eight people in three double bedrooms (two with en-suites) and a twin room. There is also a family shower room. The rest of the cottage consists of a kitchen with dining area and breakfast bar, a utility, a dining room and two sitting rooms, one with an open fire and the other with a solid fuel stove, and a conservatory. To the outside there is ample off road parking and lawned garden with patio and furniture. Alderbrook House is ideal for families or groups of friends wishing to explore this wonderful area. Glenbrien is a small village in County Wexford. Close by is the town of Enniscorthy, the second-largest town in County Wexford. The town has a hilly feel and boasts a splendid Norman castle, which is home to the Wexford County Museum containing items of local and agricultural interest. Enniscorthy makes for a fantastic touring base being close to beautiful mountains and long stretches of coastline just waiting to be explored. Oil central heating with open fire and solid fuel stove. 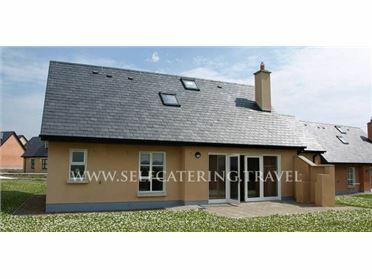 Electric oven and hob, microwave, fridge, freezer in shed, washing machine, dishwasher, TV with Saorview, WiFi. Fuel, power and starter pack for stove and fire inc. in rent. Bed linen and towels inc. in rent. Cot and highchair on request. Ample off road parking. Bike storage. Lawned garden with patio and furniture. Four well-behaved pets welcome. Sorry, no smoking. Shop 3 miles, pub 1 mile..